Well Integrity Management & Well Monitoring Systems & Solutions | Silixa Ltd.
Good well integrity is vital to eliminate the risk of uncontrolled release of formation fluids throughout the life of the well. Our ArrayLog™ services utilise distributed acoustic (iDAS™) and distributed temperature (ULTIMA™ DTS) data to detect fluid movement. When well parameters point to the failure of a barrier it is necessary to identify the source of the failure in order to plan remediation, or to demonstrate the continued integrity of the barrier for normal operations. Distributed fibre optic sensing offers a unique way to quickly and efficiently detect the fluid movement which may indicate barrier failure. The iDAS and ULTIMA DTS can be deployed periodically to detect leaks or flow behind casing by running a fibre optic log as either a slickline, cable or coil tubing intervention. The optical fibre behaves as a sensor array so the entire fibre path is surveyed simultaneously allowing well integrity issues at undetermined depths to be detected and localised almost immediately. Where an optical fibre cable is pre-existing it is possible to interrogate the optical path without the need to intervene in the well. 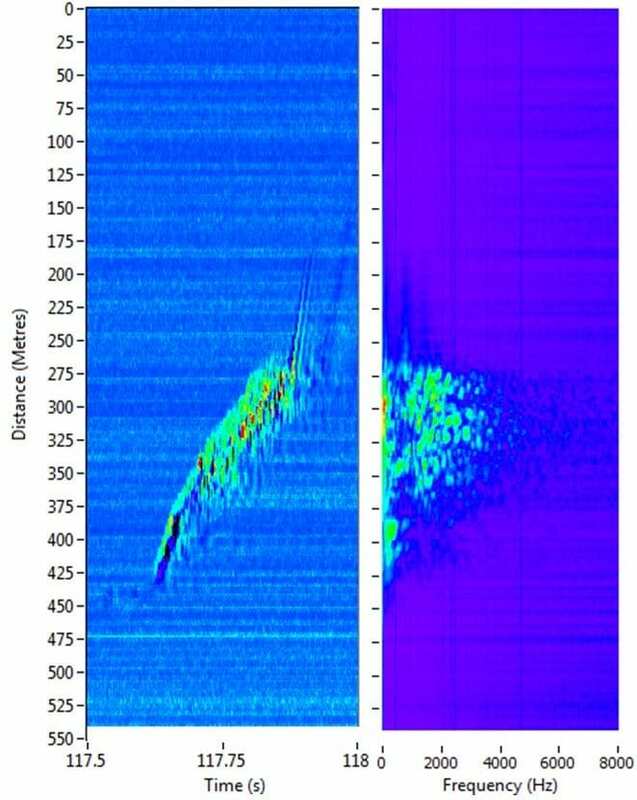 With an optical fibre cable placed in an abandoned well, the iDAS was able to listen continuously over a period of several hours and subsequently capture a single discrete event signalling the periodic release of accumulated gas pressure behind casing. Unlike point sensor leak detection, the distributed nature of the iDAS measurement ensures that all such events are captured.